Board Meeting #6 13 October 2015 – Telephone Conference. Board Meeting #5 30 March 2015 – Telephone Conference. Board Meeting #4 19-21 January 2015 – Canberra, Australia. Board Meeting #3 06 October 2014 – Global Telephone Conference. Board Meeting #2 14 May 2014 – Global Telephone Conference. The first meeting of the OneGeology Board took place on 22-24 January 2014 in Tucson, Arizona. The future of OneGeology meeting, 21–22 October 2013, Paris, France. The meeting was held in Paris. The 5th meeting of the OneGeology Steering Group took place on 4 August 2012. The meeting was held at the 34th International Geological Congress. 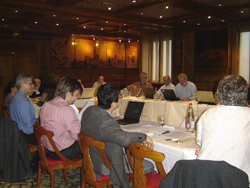 The 4th meeting of the OneGeology Steering Group took place on 27 – 28 September 2011. The meeting was held at International House, Tokyo. Due to the earthquake and tsunami in Japan, the full Steering Group meeting has been postponed until later in the year. To progress urgent items on the agenda, a telephone conference was held. The third meeting of the OneGeology Steering Group took place on 15 - 16 April 2010 at GNS Science, Avalon, Wellington, New Zealand. Please see the steering group page for information of your regional representative. See a review and photos of the meeting. The first meeting of the newly appointed Steering Group committee will take place in Paris on 23rd – 24th April 2009. Agenda items will include the governance structure of OneGeology, the sustainability of the initiative, Intellectual Property Rights and sponsorship. Because of the success of OneGeology and discussions between directors before and during the IGC the original Steering Group meeting had been broadened in scope and attendance. The 2012 meeting of the Operational Management Group was held in August at the International Geological Congress in Brisbane. Sunday 5th August 2012: 10:00 - 17.30. The 2010 meeting of the Operational Management Group took place on Monday 23rd August 2010 at the Federal Ministry of Economics and Technology under the umbrella of Minister Bruederle, Germany. SEGEMAR hosted the 2009 OneGeology Operational Management Meeting on Thursday July 2 and Friday July 3 in Buenos Aires. The "Asociacion de los Servicios de Geología y Minería Iberomaericanos" (ASMGI) has agreed that the Servicio Geológico Minero Argentino (SEGEMAR) would host the 2009 OneGeology Operational Management Meeting on Thursday July 2 and Friday July 3 in Buenos Aires. An article about the meeting was published. You will find it at page 4 of Newsletter IDE Iberoamérica. 14th August 0900 - 1200 – 33rd IGC, Oslo. The 3rd meeting of the Operational Management Group was held on the 14th August at the IGC, Oslo. OneGeology-Europe Proposal to the EC. 21 European geological surveys have submitted a 3.25€ million OneGeology-Europe proposal to the EC for funding under the eContentplus programme. The proposal has received a very positive technical and scientific evaluation and subject to negotiations to take place in Luxembourg on 10th April, is looking likely to be funded. The project could start as early as June 2008. The second meeting of the Operational Management Group was held in Paris on 1st March 2008. The meeting was attended by 17 participants and included discussion and action on the following topics: funding and support, communication and website, organisation, governance, roles and responsibilities, and planning for the 33rd IGC. 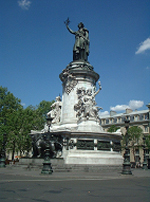 Why did we choose to hold the OneGeology meeting at the Place de la République? 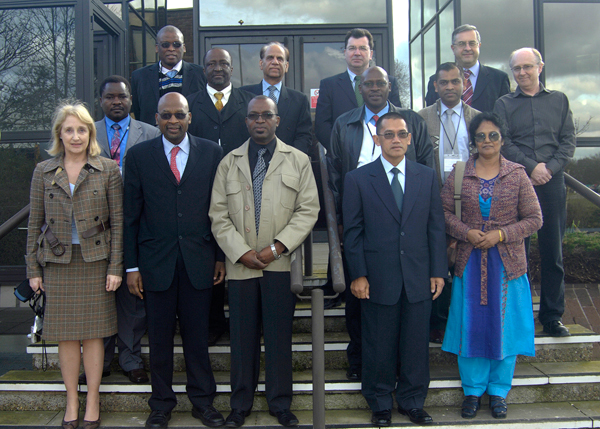 Commonwealth meeting on 26th February 2008 at the British Geological Survey, Keyworth, UK. Eleven directors of Commonwealth geological surveys met at BGS in Keyworth. As part of their visit they were given a presentation on OneGeology. As a result several new nations are now participating in OneGeology. The kick-off meeting introduced the outline of the OneGeology Initiative and discussed how to organize the project among the CCOP Member Countries. The meeting was held at the Geological Survey of Japan, Tsukuba, Japan. The first Operational Management meeting was held at the Geological Survey of Canada in Ottawa on 2nd and 3rd November 2007. All presentations and documents from the meeting can be accessed from the downloads page. The kick-off meeting was held on the 12–16 March 2007, where 81 geoscientists from 43 countries across the world gathered to consider a proposition — would they be prepared to collaborate to create a global geological map dataset? See the 'how will we do it?' pages for more information.